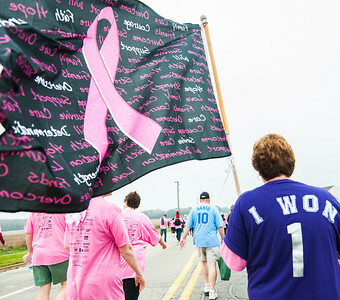 Danielle Guerra for Shaw Media Cancer survivor Kathy Carlson, of McHenry, carries a flag while walking the 16th annual Care4 Breast Cancer 5K in Woodstock on Sunday, October 16, 2016. Carlson was wearing the shirt she had made for the last day of her treatment announcing victory against cancer. Proceeds of the Care4 Breast Cancer 5K support the Family Health Partnership Clinic's Breast Cancer Fund. 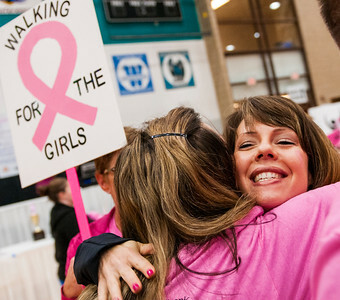 Danielle Guerra for Shaw Media Jill Flores, of Woodstock, hugs cousin Maureen Parlberg, of Crystal Lake in the Woodstock North High School gym before the start of the 16th annual Care4 Breast Cancer 5K in Woodstock on Sunday, October 16, 2016. Flores, a trainer at Woodstock Recreation Center, was diagnosed with Stage 1 invasive ductal carcinoma in June and was the inspiration for team Fight Like A Girl made up of more than 80 members who donated or participated. Proceeds of the Care4 Breast Cancer 5K support the Family Health Partnership Clinic's Breast Cancer Fund. Danielle Guerra for Shaw Media Cheerleaders and Poms from Marlowe Middle School in Huntley cheer as they line the start of the 16th annual Care4 Breast Cancer 5K at Woodstock North High School on Sunday, October 16, 2016. 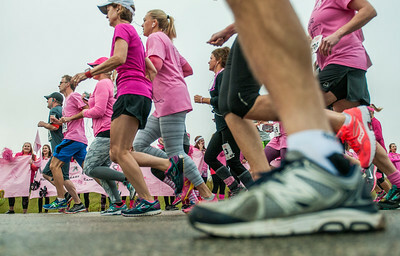 More than 1,600 participants either walked or ran the race which supports the Family Health Partnership Clinic's Breast Cancer Fund. Danielle Guerra for Shaw Media Jill Flores (center), of Woodstock, smiles with her husband Joe Flores (right) after finishing the Care4 Breast Caner 5K at Woodstock North High School in Woodstock on Sunday, October 16, 2016. Flores, a trainer at Woodstock Recreation Center, was diagnosed with Stage 1 invasive ductal carcinoma in June and was the inspiration for team Fight Like A Girl made up of more than 80 members who donated or participated. 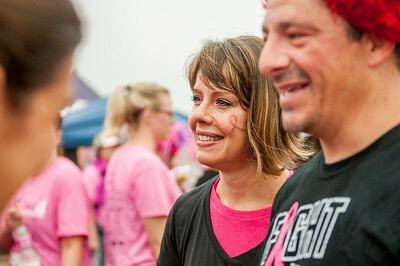 Proceeds of the Care4 Breast Cancer 5K support the Family Health Partnership Clinic's Breast Cancer Fund. 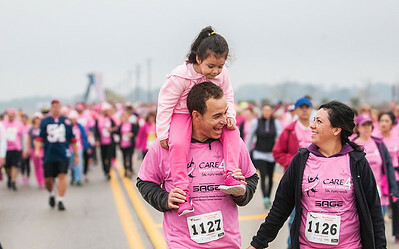 Danielle Guerra for Shaw Media Maria Bernal (right) walks with Oscar Mendoza (center) holding daughter Bella Mendoza, 4, down Raffel Road during the 16th annual Care4 Breast Cancer 5K in Woodstockl on Sunday, October 16, 2016. 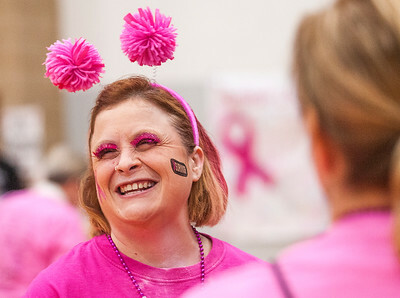 More than 1,600 participants either walked or ran the race which supports the Family Health Partnership Clinic's Breast Cancer Fund. This was their fourth year walking. Danielle Guerra for Shaw Media Ten year cancer survivor Denise Tomlinson, of Wonder Lake, smiles while waiting for the start of the 16th annual Care4 Breast Cancer 5K in Woodstock on Sunday, October 16, 2016. Tomlinson started participating in the Care4 Breat Cancer 5K nine years ago while she was undergoing chemotheraphy treatments and remembers she would barely walk the entire course. 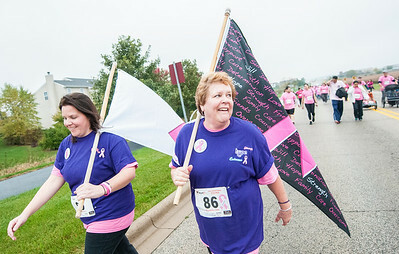 Danielle Guerra for Shaw Media Cancer survivor Kathy Carlson (center), of McHenry, carries a flag with daughter Kelly Carlson (left) while walking the 16th annual Care4 Breast Cancer 5K in Woodstock on Sunday, October 16, 2016. Carlson was wearing the shirt she had made for the last day of her treatment announcing victory against cancer. Proceeds of the Care4 Breast Cancer 5K support the Family Health Partnership Clinic's Breast Cancer Fund. 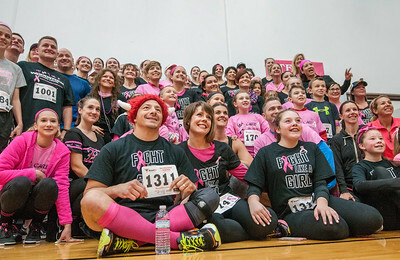 Danielle Guerra for Shaw Media Cancer survivor Jill Flores (bottom center), of Woodstock, smiles with her husband Joe Flores (bottom right) and daughters Abby Flores (right center) and Gwen Flores (right) and 80 members of team Fight Like A Girl before the Care4 Breast Caner 5K at Woodstock North High School in Woodstock on Sunday, October 16, 2016. Flores was diagnosed with Stage 1 invasive ductal carcinoma in June and was the inspiration for team Fight Like A Girl. Proceeds of the Care4 Breast Cancer 5K support the Family Health Partnership Clinic's Breast Cancer Fund. 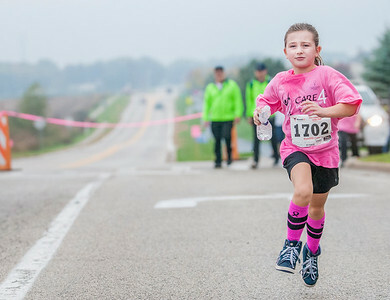 Danielle Guerra for Shaw Media Madison Sofie, 8, of Woodstock, runs down the home stretch of Raffel Road during the 16th annual Care4 Breast Cancer 5K at Woodstock North High School on Sunday, October 16, 2016. More than 1,600 participants either walked or ran the race which supports the Family Health Partnership Clinic's Breast Cancer Fund. 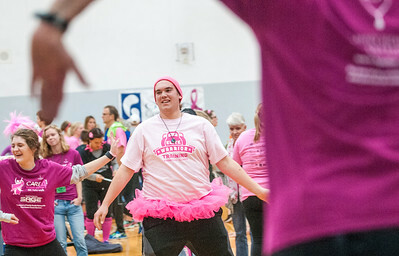 Danielle Guerra for Shaw Media David Rath, of Woodstock, wears a tutu while he warms to with Zumba before the 16th annual Care4 Breast Cancer 5K at Woodstock North High School on Sunday, October 16, 2016. More than 1,600 participants either walked or ran the race which supports the Family Health Partnership Clinic's Breast Cancer Fund. Danielle Guerra for Shaw Media Volunteer Mary Lou Mumford, of Twin Lakes, Wisconsin, gives out high fives to participants of the 16th annual Care4 Breast Cancer 5K at Woodstock North High School on Sunday, October 16, 2016. More than 1,600 participants either walked or ran the race which supports the Family Health Partnership Clinic's Breast Cancer Fund. 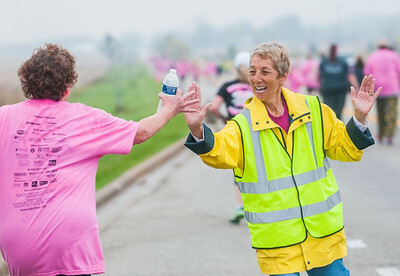 Volunteer Mary Lou Mumford, of Twin Lakes, Wisconsin, gives out high fives to participants of the 16th annual Care4 Breast Cancer 5K at Woodstock North High School on Sunday, October 16, 2016. More than 1,600 participants either walked or ran the race which supports the Family Health Partnership Clinic's Breast Cancer Fund.